Sankhu Nagarkot hiking offers you the real Nepal village hill hiking with the panoramic views of Himalayas. 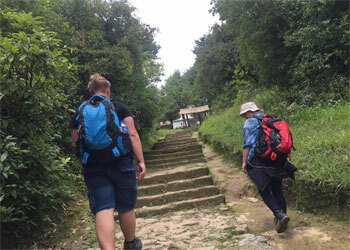 Two-day hike from Sankhu to Nagarkot is the best way to explore Nepal with its Nature and culture. The Sankhu to Nagarkot hiking starts at the Newar village of Sankhu after a drive of about 1-1.5 hrs from Kathmandu. A small and pleasant village of Sankhu is a major pilgrimage site with the temple of Bajrajogini. Now you hike from Sankhu to Nagarkot and it takes about three and half hours. It’s a bit difficult climbing the hills but one can do it. One can see beautiful scenes of mountains like Gauri Shankar, Langtang and the Everest which will be your memorable experience. The village of Nagarkot is on the edge of the valley and offers superb views of the mountains as well as Kathmandu valley. Very next day morning, the sunrise and sunset in the Himalayas seen from this hill will be a lifetime memory for many. From tower at Nagarkot, we can see a few black-spotted mountains as a result of climate change, the greenery around it, one of its few remedies, barely visible scenes and some lovebirds. The most popular walk leads down from Nagarkot along a ridge to the temple of Changu Narayan -with views of Sankhu village to the right and Bhaktapur to the left. The temple of Changu Narayan is the oldest temple found till date in Nepal and is dedicated to Lord Vishnu. It is an impressive temple situated on top of a small hill, which is approximately 16 km from Kathmandu. After having breakfast, drive for about 1-1.5 hrs to Sankhu. Sankhu is medieval Newar village which is major pilgrimage center for Hindus. The temple of Vajrajogini is situated here where a big mela is organized for one month. People keep fasting and worship here leaving their home for one month here in the name of goddess Parvati. From here we hike to Nagarkot for the night stay. it will be easy hiking through the nice terraces and fields, we will hike about 3/4 hours. you can ejnoy the view from Nagarkot and evening drive back to Kathmandu by private vehicle. Twin sharing accommodation during the hiking with breakfast. Travel Insurance, tips and gratitudes.